I am Pro-Test, are you? Please leave comments on this thread (scroll to bottom of page) to announce – I will not be scared away by extremists – I believe in biomedical research – I will be at the rally on Thursday 8th April, 11:30 AM (corner of Le Conte and Westwood). If you can’t make the rally (geographic location does not permit), leave a message of support for those marching! On behalf of the Society for Neuroscience (SfN), I write in strong support of you as you speak out for animal research. Today, your activism is helping to raise awareness about the life‐saving research underway in the Los Angeles area, and by extension, hundreds of other communities nationwide. On behalf of 40,000 SfN members worldwide, thank you for your continuing leadership on this issue. SfN pledges its sustained commitment to strong advocacy with you and many other vital voices. Posted on April 7, 2010 April 9, 2010 by EditorPosted in Campus Activism, NewsTagged animal researchj, April 8th, marching, pro-test, pro-test for science, rally, speaking of researchj. Sometimes people overlook the benefits to animals that result from animal testing. My horses have extended and productive lives because of medicines, especially anti-helminthics, that have been developed through animal testing. Indeed, medicine for treating animals cannot exist without being tested on animals. I live far from California and from Britain, but my horses and I are with Pro-Test in spirit, wherever action is being taken to fight back against those who would tear down medical research on the specious basis of animal rights. I had to miss this years rally and I am very glad it was a major success yet again! Researchers have touched my life in the last year in ways I could not have imagined before cancer touched my life. In speaking with researchers it is very clear to me they pursue their work not for selfish reasons such as money or fame. Rather, it is a love of knowledge, a love of life, ALL life, that moves so many toward this career. I thank them in person whenever I get a chance. I thank them by speaking to other about what wonderful things they are doing for all of us. I thank them through letters and rallys like this. And I thank them in my prayers for every day I spend with my loved ones who have been given more time on this earth because of that life giving research. Although I was not able to attend this year, I have been holding my own rally of sorts every day hoping that as I speak out, others will hear and join us in our quest. I am Pro-Test and I am Speaking of Research every day! I have had many non human friends and dependents throughout my life as well as a family of humans. We have all, no matter what species, benefited from and thrived because of animal research. Keep up the good work. You are the voice of sanity, love and intelligence. I support the humane and ethical use of animals in research. Thanks goodness for the scientists at UCLA and around the world who are proud of their work to improve the health of humans and animals by their ongoing research. The vast majority of people in the United States and around the world support humane use of animals in research to develop new medicines. The rally at UCLA is a strong message that fighting back against the vocal minority who seek to stop progress on human health has real consequences. Thank you to those who came out to show the human face of critical animal research and let’s continue to work together so that this research can continue to improve the lives of humans and animals around the world. Animal work has benefited the quality of life of all humans. I thank them and the valuable work of those that have dedicated thier lives to carrying out that science. I have three dogs and an extended loving family. Not one of us has not benefited from animal research. I support them, and believe what they are doing is for the betterment of all mankind. I would be there with you if I could, but am with you in spirit. We must stand up for science and research! Thank you! I don’t think I could do animal research myself, but I am glad that ethical and moral people are willing to undertake it for the benefit of humanity. Thank you, scientists all. Kudos to all the people who have the courage to stand up for this cause. Lab animals deserve to be treated like kings. Doing that and doing good research can go hand in hand, and it is highly valuable work. I’m sorry I couldn’t attend. Great work. The march and rally was a big success, and I was extremely proud to be a part of it! However, this is only the beginning of our efforts. We must not waiver from our mission to stand up to bullies, terrorism, and extremist rhetoric. By standing together we can shine a positive light on such a worthy cause – to find cures and medical advances that will help human and non-human animals alike! So get the word out! Better yet, organize a similar event wherever you may live. I was there! yelling louder than most! With you in spirit and cheering everyone on from Washington DC. Many, many thanks for standing up for research, the good people who do it and all of us who benefit. I wish I could be there. Animal research teaches us many things that we need to know about animal health and our own health. I can’t be there in person, but pleased be assured I am there is spirit. We all admire your courage and strong hearts. Residing on the other side of the country, I can only be there in spirit. But many thanks to all who are standing up to extremists and supporting research. Good luck with the rally and all your efforts! It was so exciting to be a part of this event last year, and I wish I could join you all again this year, but I’m thinking of you today and thankful for all of you who are brave enough to stand up for science and who refuse to be intimidated! Thank you!!! How I wish I could be there!! Unfortunately I am on the East Coast…but I will be there in spirit!!! This is just such an important cause and we have to stand up to the terrorists. I am a Faculty member in the Department of Psychiatry at UCSD. I wish I could be there today to lend my support. We must all be vocal in our support of this cause, for a cause it is. Too long have we few struggled with developing medical treatments while retaining our humanity, while some would have us demonized for it. I am an animal lover, in all forms, but I do recognize that the need for medical treatments throughout the animal kingdom is essential to counter widespread diseases in our time. Cholera, measles, mumps, anthrax, antibacterials, and many more, could not have been treated or developed were it not for animal research. If you are anywhere near UCLA, and can make it, show your support! Sending support in spirit from the Southeast. We need to continue this important work to save the lives of animals and humans. I will be there, because I believe in the importance of continuing to make advances in life-saving biomedical research. For those of us who had seen the impact of brain stroke and cancer in our families, it is hard to imagine a world in which progress in medicine is stopped by a small group of fanatics and terrorists that use violence to impose their views. I strongly support the humane and federally regulated use of animals to fight human and non-human disease. Unfortunately, my geographic location does not allow me to attend, so I send my support from Australia. I used to work as an Animal Health tech @ UCLA and I am soo proud of what you are doing! Go Research! Improve lives for animals and humans! Due to international travels I will not be able to attend, but I thank everybody who does for their enormous courage and support of a society where reason and not fear is valued. I can’t make it to the rally in person, but my spirit is with you. Thank you for what you’re doing! I am a DVM researcher and I will be there in spirit – I support biomedical research. I wish I could be there! Thank you for representing our point of view! We cannot let extremists misinform the public. Animal researchers are not monsters! They realize that when conducted humanely, animal research is so important for the advancement of science. Although I won’t be there for the rally, I stand in support of the humane and necessary use of animals in research to advance medical treatments and cures for both humans and animals. I am grateful for the work that you do. My thoughts and support are with you today, even if I cannot attend the rally myself. DrugMonkey is right: we cannot give way to a handful of extremists – each and every one of us can do something to take a stand for research! It’s great to see thatr so many of you are planning to attend the rally. Unfortunately I’m stuck on the wrong side of the Atlantic and won’t be able to join you all in person, but my thoughts will be with you! Wow, has it been a year already? Kudos to the Speaking of Research and UCLA Pro-Test teams for keeping the flag flying this entire year. Opinion articles in several journals, forums at society meetings, this blog and lots of emailing to scientists. If you cannot attend the rally, remember the online world provides tools where ever you may reside. comment on newspaper articles. take the time to rebut the lies. We must no longer cede the media campaign to the extreme minority position. Core values of humane civilization are under attack. I am glad Pro-Test is there and stands up against this. I will be there to support tomorrow. i’m down with testing for research. but i can’t come to the rally tomorrow. go research, i’d rather test on mice than human babies. Looking forward to standing up for scientific progress with UCLA colleagues and the LA community! We support biomedical research! Our support is fully behind those going to UCLA tomorrow. I won’t be able to come to the rally, but I’ll be having conversations (in real life and at my blog) about why I support humane, ethical animal research. I will be working across the country taking care of lab animals and can’t be with you in body, but I am with you in spirit. THANK YOU to all of those attending and who will be convincing others to attend. Thank you to the researchers, the vets and vet techs, and the public who cares and support us against these heinous acts of terrorism. Thank you to those who blog and write about this momentous uprising. We will not be intimidated. We will not stand quietly. I will be there to support medical and scientific progress! And I stand against terrorism and extremism!! I am so happy to be part of this movement to stand up for science and biomedical reserch. Fire-bombs don’t cure disease. Advances in treatment come from the efforts of hardworking scientists in labs all across the country and the world. I won’t be in town; someone please bring a friend to fill the space I should! I’ll be there to support those who work toward improving the health of animals as well as humans. I will be there tomorrow! I denounce terrorism in all forms. And I believe that the pursuit of science, which must include understanding ourselves, is one of the noblest human endeavors. I strongly support the humane use of animals towards this purpose. The voice of reason will be heard. I give my whole-hearted support to my bioscientist colleagues at UCLA and around the world who stand up for our research. Animal research saves lives and it’s because of animal research that progress in biomedical science can be made. All the power to you all tomorrow. I will not be able to attend this year (due to an IACUC inspection-how ironic) but I will be there in soul! I wish I could be there with you all. My best wishes for a strong and successful day. I do not live in the area and thus cannot attend, but I strongly support the cause. Please keep up this important fight for responsible animal research to benefit us all. I cannot be there but you have my support! Just say no to terrorist groups who threaten the work and lives of researchers. I will be at the rally! “Rock On!” I’ll also be there – marching/protesting for the acquisition of the knowledge and the dispelling of the ignorance that would otherwise leave current generations and countless future generations in want for those treatments, cures and preventative measures that can only come from research programs that include animal research. Also, i’ll be there in support of the non-violent expression of opinions and for open dialogue between the public and scientists who conduct research with animals. It’s a long walk from here, but I support research! Just this year my child’s school was racked with the loss of a bright, popular and athletic child following a several year fight with a disease for which we as yet have no cure. This child made the lives of his family and friends all the better during those several years in which medical advances based on animal research brought the disease to a standstill. Alas it was temporary. Stories such as this one hit every family, every community. I, for one, am grateful for the smart, selfless and dedicated individuals who are willing to risk the terrorist attacks of extremists merely for trying to improve the health and well being of us all. I support animal experiments, conducted under proper protocols. The knowledge obtained from animal experimentation has facilitated the alleviation of pain and suffering for innumerable human and animal medical patients. I further support non-violent expression and rational discussion. I’ll be bringing a contingent from USC to show our support for the life saving work being done by the scientific community in LA. I will be there! Treatments for physical and mental illnesses require basic research that cannot be conducted without the humane use of animals. I am a student at UCLA and I will be at the rally tomorrow in support of science. Come and join us stand up against extremists! I will be there as I support both animal research and non-violent ways of expressing my opinions. My name is Bryant Horowitz and I will ABSOLUTELY be at the Pro-test rally in support of animal research to save and better human lives! I am Carlos Portera and I will be there, along with members of my lab. Sorry I won’t be able to attend the rally in person, but I am there in spirit. I fully support this important show of hands for ethical conduct of research on animals. Such work is crucial to reduce human and animal suffering from a wide variety of diseases. The lack of a vaccine to HIV, Malaria and TB are potent reminders of the sufferings that could be averted by medical research that has already given us vaccines against polio, measels and other devastating diseases. For science and research! 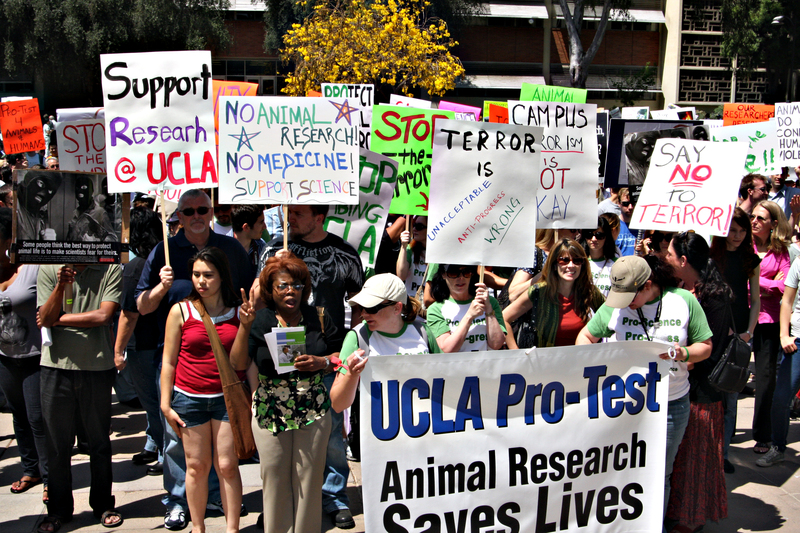 I’m a professor at UCLA and will be marching tomorrow in support of humane animal research that is critical to the health and welfare of both animals and people alike. It’s time we stand up to the violence and misleading rhetoric from extremists. I am a neuroscience grad student at USC. I wish I could be there to show solidarity with our cross-town colleagues, among others, as this is a matter of huge importance. Thanks to all that are attending! There are many of us all around the country who support you. In this case, the real silent majority. We are glad to see that you have the conviction to speak out in public in order to offset all the other negative rhetoric and propaganda. I will try to be there! But even if not, I am Pro Test ! I’m a professor of physiology, a neuroscientist and a practicing neurologist. I’m unable to attend the demonstration, but I will be with you in spirit. Like you, I support and am grateful for the humane use of animals in research. Thank you for standing up for biomedical research. Sending support and appreciation from North Carolina for the efforts of the scientists, community, students, and others who are rallying tomorrow to speak out for the importance of research. Thank you for your work! I support the rally although I cannot be there in person. I support the rally for animal research. I cannot attend but am on the side of ProTest! I’ll be there. The message needs to be sent loud and clear: animal research is an essential component of efforts to fight disease. If we want medical progress we need animal research. I love animals, but I also love human health and human knowledge. It is a fact of life that there is no substitute for in vivo research for a huge array of medical therapies. Medical scientists are not in the torture business, and they do not do their research for the money – they do it for you, your children, and the benefit of humanity. I will be there, my son will be there and I will join the forces for rational use of animals in research. I will be at the rally to support this very important issue. I can’t make it to the rally but I signed the petition: http://www.amprogress.org/petition! I am eternally grateful for the medical advances that have come from animal research and to the scientists working to find new ones! I will be at the rally to stand up for science! Sending best wishes to those at the rally tomorrow. This is an important issue and one that must be fought for, don’t let extremists deter you. I’ll be there, supporting my fellow researchers! I send my support to all of the scientists, researchers, university staff, students and memebers of the public that will stand together tomorrow to show thier support for animal based research. to show the community the value of research for everyone. I am a UCLA SRA and I will be marching at the rally!! The issue of pursuing medical progress is way too important to ignore!! We have to stand up to the terrorists and let them know that “We’re mad as hell and we aren’t going to take it anymore! !” All of our lives have been touched in some way by the scientific discoveries that have come from the humane use of animals in research – even the lives of the extremists!! I will be there tomorrow in support of the vital research done in labs around the world every day. I will be there… please come and show your support! I am sending out my support to biomedical research and its important contributions to human health and knowledge. In particular, I’m sending my support to the researchers who do this hard work for all of our benefit, sometimes in the face of violence. I am too far away to participate in the rally. I will be there! Thanks to those who helped organize the event! I can’t be in the state but think this is a very worthy cause and applaud everyone’s support. Wish I could be there. Don’t let terrorism derived from flawed-emotion-based dogmatic doctrine, stymie valid and necessary scientific research under any circumstances! Because I believe in the value of humane animal research I will be there tomorrow offering my support. I support science over fundamentalist demonization and stand with the research community for the betterment of humankind. Good luck with the gathering. I will be at the rally. I wish I could be there! We can’t allow ourselves to be bullied anymore. Best of luck, I hope it’s even better than last year! I am a Professor of Neurobiology and Psychology at UCLA. I will be there tomorrow defending the work I believe is critical for the advancement of medical science and medicine. If such work were to stop, 90% of medical research would come to a complete halt. The public must understand there are no viable alternatives. I will be there to show my support to the scientific community for their hard work and efforts to improve our lives. I am a Veterinary Technician and support Pro-Test! I will be marching tomorrow with my Mother, and my Aunt. Biomedical research has touched our lives in many ways, prolonging and improving the lives of our family members. I support all of the scientists who dedicate their lives to improve the lives of others. My husband and I will be there. Whoo-Hoo!!! I will be at the rally tomorrow standing up for science! I will not allow a few to stifle the hope of many – science saves lives! I’m David Jentsch – a UCLA Professor and researcher. I will be at the rally to show my support for basic biomedical research, as well as for the myriad of scientists, staff members and students who make crucial discoveries that enhance the health and welfare of humans and animals alike. I will be at the rally tomorrow and would like to encourage everyone that is able to travel to the UCLA campus tomorrow to join us in this important show of solidarity! I’m Tom Holder – I will be at the rally tomorrow!